"I will not get a dog," I said. There's just too much craziness going on right now. Things are too busy, and I cannot possibly have another life form dependent upon me at the moment. Never mind that children have begged and read books about canine obedience and have DVR'd The Dog Whisperer until it can't be DVR'd anymore. "I will not get a dog," I said. Someday, just not now. Never mind that I really, really love dogs. Never mind that my sweet eight-year-old boy loves dogs to the core of his being, and he's needed a boost of something special this year. Never mind that the book is almost done and a little whiff of Normal seems to be (Lord willing) just around the corner. STILL. Just can't do it, not yet. I will not get a dog. For reasons completely unknown to me, late one night my typing fingers made their way to Petfinder. He'd been living in a rescue for four months. I looked at his picture and tried to explain that I'M NOT GETTING A DOG. And I am entirely besotted. Deadline, schmedline–sorry, Editor O' Mine, but I can't work today because I have to sit on the couch with this puppy curled up in the crook of my leg. There's really only so much work that can be done with a wet puppy nose rested on your laptop. 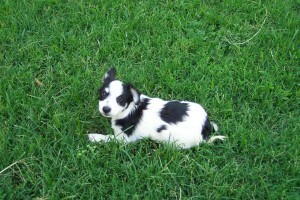 He's one-half Corgi and one-half Havanese. His name is Toby, although in keeping with this family's tradition to bestow multiple nicknames on anything that moves, he's also known as Tobalicious, Toby Wan Kanobi, Totally Tobular, and Tober Meister Meister Tober. The rescue organization did the best they could, but he was surrendered by a breeder–his first four months were spent entirely in a kennel. He is painfully timid, and the poor thing now finds himself smack in the middle of the Loudest Family In America. But the kids, to their credit, are so eager to woo him back to confidence that when they bicker over whose turn it is to cuddle him, they bicker in whispers, so as not to frighten him. In what has been a swirly season of book-writing, and a double-soccer season, and swine flu, and scout campouts, and a hundred other frantically frantic obligations that keep us out of breath, enter Toby, to slow us down. Love something together. Give of ourselves together, as a family, to pull this little guy out of his shell. It may be the sweetest time we've ever had. He's a 12-pound, eight-month-old bundle of Just Exactly What This Family Needed. I always bring my pets in when everything is crazy. Doesn’t make anything crazier and people just smile more. Well done. What a cutie! And how divine to find your dose of Exactly What You Needed When You Needed It! We too find ourselves with a new addition, out of the blue. 6 wks old. Black lab retriever. I couldn’t say no. Abandon reason, I told myself. Say yes. Good buddy came home with the 3 lbs of pure energy in his coat pocket. Love your post! “… have to sit on the couch with this puppy curled up in the crook of my leg” — ha! I so understand! A warm sleepy pup is kryptonite! awwwwww he’s adorable. my husband won’t buy me a dog because our son would torture it until it ripped him apart. but still… I WANT A DOG! i have this theory – no sane person can resist a dog’s “come hither”. it’s a losing battle. Toby looks cute! and looks pretty smart, once he’s no longer shy, watch out for the mischief!! That is one cute puppy! And personally, I love the name Toby Wan Kanobi. Toby, with all his infinite nicknames and irresistible raccoon eyes, is quite possibly the cutest family togetherness project EVER. So precious! Hey! We just got a puppy, too. His name is Tex and he has stolen my heart. So glad to know I’m not the only one turning down invitations ‘because I need to check on the puppy.’ Enjoy your sweet Toby! He is adorable! Maybe I need to get a dog… oh wait, I already have two 🙂 we’ll have to try something else! And little Toby has found a wonderful home where he will live a happy life surrounded by love and…..well….noise. He can come over to our house when he needs a quiet time!! Oh what a cute little pup and at 12 lbs you can stuff him in a bag and take him everywhere…I can’t do that with my 55 lb bundles o’love. Congrats to the newest member of your clan. I also am not getting a dog. Except we really aren’t. He’s a CUTIE and I LOVE LOVE LOVE the nicknames! you are NOT helping me not get a dog!!! Oh my! We are experiencing the same thing at our house! Our “I will not get a dog” is Cocoa— and she is a joy! I am not sure who is enjoying her more, my 51 year old husband, or the three children! (Seriously, I think its Husband) She has been with us for 2 days and more productivity level has dropped significantly. Enjoy! My four year old is Toby! 🙂 We also hear Tobs and Toby Nairobe. 🙂 Toby Wan Kanobi is a favorite around here. Welcome, Toby! Good Dog! He’s a keeper for sure. On the “Tobs” make it a long o sound. Sometimes we’re wrong. And that’s what makes it so right. Congrats to you and your family! I said the same sort of things about a cat (which I am allergic to)…..but right now, in our garage, is the cutest cat that you’ve ever seen, purring peacefully because he has food and a home with a family who loves him. So, now my brand of crazy includes my family, my sweet little dog, and my adorable cat…but that’s where I draw the line….right? Awww! He’s so cute. He will be a best friend and confidant. I had a dog AND a cat (not at the same time) that needed ‘rehab’. Your kids are on the right path – lots of gentle loving and soon his ‘real’ personality will come out. I look at my Brady-cat running crazed through the house, or vountarily wanting to snuggle w/me, and wonder what happened to the fraidy-cat that I brought home (that’s how he got his name – fraidy-cat, Brady-cat). Enjoy your new family member! I want one! Really. My son and I are the ones in our house begging, and my husband is the one saying “I won’t get a dog”. I’m hoping he has your sticktoitiveness. Welcome Toby! Oh, you have fallen…. welcome to the club!! I am a sucker for dogs, which is why I have to draw the line at the 2 I have, even though my almost 18yo was trying to talk me into a German Shepherd puppy yesterday. I think a Great Dane and a Wire Fox Terrier is enough for our family of 6, don’t you? Toby is beautiful and lucky to have found you. Now that is a beautiful, irresistable face. Hope he brings lots of joy to your fam! Looks and sounds like he needed you guys! What a sweet little dog. I bet your children are in HEAVEN. We got a dog this past March (apparently, my 8-year-old daughter would be a great match for your doggie-loving son), and it’s been a joy to watch the relationship between our dog and Natalie blossom. They are great friends. I wish the same for you. He is so cute. I said the “I am not getting a dog” litany for almost 6 months before I succomed, almost a year ago. The kicker for me was watching my 7 year old insist on getting in the pen with my cousin’s dog last Thanksgiving and begging to let her out. (They only had her in there because there were over 70 family members in and around their house that day.) I couldn’t keep saying no after I saw that. Oh yes, I intended to say that you seem to like him much better than the rats!! Ha! Ha! Pets…..much like children, teach us an enormous lesson about love. Congratulations! Toby looks like he was created just for your home! God is good! I think it’s wonderful that you went against what you always thought and followed your heart. I can’t wait to read more about Toby! Sounds exactly like my futile attempts to avoid our Shelby, who is now my dog more than anyone else’s. She was exactly what our family needed when we needed her most . . . even though we didn’t realize it until much later. We’ve been incredibly blessed. He is adorable! I am so excited for your family. I bet he will come out of his shell and will be a just-as-loud member of the family in no time. : ) I LOVE dogs and wish we could have one. Maybe someday. My daughter has special needs so she will definitely need a companion dog one day, right? I think that sounds like a grand excuse to get a dog! Toby is so incredibly cute, I love his bright spots and I predict he will bring you lots of joy. Welcome to the “dog owners” side of blogging, my friend! Although, raising a 90 lb. doofus-dog, I predict that Toby will be “owning” you in no time, flat! What a sweetie! Congratulations on your new family member, and for not being afraid to change your mind when needed. Sometimes as a mom, I find it hard to do that. Oh, congratulations. So few things compare with puppy sweetness. Enjoy! And someday, you will roll your eyes and say, Remember when we thought this dog was *shy*?! He is so cute! I love his coloring. this post brought tears to my hormonal little eyes. We’re struggling with this decision as we speak. I am not a furry animal person… dogs shed, cats smell and I can’t even begin to explain guinea pigs, ferrets and rats. All of which I owned.. heck… I’ve had Ring necked doves, tarantulas and huge fish. What a wonderful story and gift of love you have given to your children! Oh shelter dogs are the best…did you know that the Humane Society also has sheep, goats, rabbits, and llamas? Yep they have me on speed dial for all farm animals…who brings a llama to the pound and drops them off anyway? How sweet! Congratulations on your newest addition and you sound SO much like me! We had a dog for 11 years that adopted my husband and I from a local pound even though I was only “volunteering” to work there. We also have a black lab and a yorkie that adopted our family after I clearly said “I will not get a dog” but found myself surfing on PetFinder! ha! They are wonderful and four legged little blessings that we never think we need, but wonder how we lived without! Shannon for years I told my boys that I was not old enough to get a dog. Well back in February we bit the doggie bullet and got a dog! I just love her as well as the boys. It was just what we needed. Even with all of the craziness of our baseball running lives we can’t picture life with out our sweet Cookie! Congrats and welcome to the doggie days! Just look at this way to, it’s another something to blog about! Oh my heart!! He is adorable. I am so happy for all of you. Such a face!! Oh — so precious!! And he’s lucky to be adopted into such a fabulous home! We have a Toby and he is a Tobaliscious and the Tobster along with stinky Pete. Congratulations! Does this mean you joined Michelle in the I’ll never club? How will you ever forget “I’ll never date a Sigma Nu and I’ll never move to Texas”!! What a cute puppy dog. After we had to put our second dog to sleep, I said that was it for any more animals. Then my mom went into a nursing home this year and she had a 9 year old dog. So, we took him but THAT’S it. No more dogs after he’s gone. I hope LOL. Famous last words!! Mine were, “We will not get another dog.” We got another dog. And I LOOOOOOOOOOOOOVE her. She had been living for 6 months with an elderly couple. Imagine her surprise when she ended up with the other Loudest Family in America. She used to pass out on the couch about 5:00 each night and be up with the roosters. She has adapted to our schedule and we love, love, love her dearly. Enjoy your doggie! Toby is precious! I can totally see what you buckled! What a sweet face. So happy that he has a home to call his own. He is adorable … the little manipulator. 🙂 I’m so glad you are all happy together! He is so adorable and cute. He is so beautiful! I am very, very happy for you. I know he will be just what your family needs this year! Congratulations on your puppy! I just recently found your site and already feel a part of your family. I know how hard it is to bring a new skittish family member into the fold. We just adopted a two year old momma cat from a local store that had been in a kennel for three months. When we brought her home we decided to ‘totally leave her alone to get acquainted’. Yeah right, my husband immediately started talking to her (in the third person eg. Is it dinner time for Torrie-cat?) and our other kitten started to torment her. Have fun with your puppy and treat him gently (as much as four kids can). I belong in the “we are not getting another dog” and it lasted for a whole week after Poppers died. Jack just fills the hole in our lives that we had waiting for him! Toby looks great and he’ll be well loved which is all any four-legged family member needs. He’s lovely! Dogs restore your spirit–there’s no doubt… The best part about working at a boarding kennel is the daily dose of unconditional acceptance, joy in a new playmate, lunch partners (just a little bite…or five), and the complete lack of self-consciousness. I’m so glad that you were able to bring a seed of that joy home, and even more thrilled that you adopted!! Congratulations on your new family member!! and it continues. because I read posts like these. Dogs teach us about unconditional love until we get to be with the Author of it. I honestly think that if someone forced me to name my best friend, it would have to be Walt, my 80 pound rescue dog I started keeping “for a while” for my son (your brother) about 6 years ago! excellent choice – we got a “new” old dog last spring and then have gone through some big upheavals in our life – laughing at Zoe the dog has been great for us – hope that handsome little fellow brings as much happiness to your family. Oh No!!! Did I write this post??? Only I haven’t gone and done it yet! I have been looking at Petfinder and the local humane society now for TWO years!! All the while telling myself all the same things you did. Excuse me now while I go to Petfinder to gaze lovingly at all the little sweeties out there that are calling me (and MY 8 year old boy’s)name! 🙂 So it is worth all of the extra care and chaos, huh? Oh my! I am doomed! Your story could be our story except our 6 month, 28 pound bundle of just what our family needed is named Rudder, Rudder Bean, Booger, or just plain Bean! What a sweet baby! Good therapy for a stressful life. I can tell by the look in his eyes that he knows you rescued him from a bad life and brought him into the lap (pun intended) of luxury! I have one that my daughter brought home, as a puppy, her senior year of high school. Now that she’s in her senior year in college, GUESS who feeds, loves,worms, exercises, dotes on, and swears she will NEVER EVER EVER have another dog, it’s like having a toddler? One guess. Aw, he’s adorable! Congrats on the new addition! Congratulations, he’s beautiful! And thank you for supporting a rescue! awww! toby…i love the name! how can you resist that adorable face? and hooray for rescues :). Precious! I just wish you’d come down to our place before hitting Petfinders. I have a grouchy cat and two misfit dogs that drive me nuts and I’d be more than willing to let you practice your boys whispering around them. What’s so funny is that after years of infertility and loss, my animals used to be my babies. We had resigned that they were all we’d have to care for. But now that we have our two miracle human babies, my animals are…well…they’re now the pets, if you know what I mean. LOL! Uh … I always said that I would not get a dog. I learned to never say never. I told my husband I didn’t want one that yipped or shed. And our “boy” is perfect! you Victoria Stilwell…..she is way better than that “dog Whisper” guy. and it is very …very easy….for adults or children. psst….if you haven’t heard. there are only 11 more tuesdays until LOST comes back. feb 2. 8-11 (7-10 cst) not sure which time zone ok is in. squee! Toby is a lucky little guy. I swear he looks happier in the second shot. I am going through exactly the same feelings re: pets. Hopefully our story will have just as happy an ending. Toby is just adorable. I hope you enjoy many years with him. He is adorable! I hope he settles in quickly and becomes a confident, happy guy! I’m still holding out on the no dog thing in this house though. I’m not sure if I can handle taking care of another being. Great save!!!! Oh, I could squeeze Toby, too cute. If this works out for you, I have a crazy, wild boxer that would like to come live with you. Well, my boys might not like me giving their dog away, but maybe we could have joint custody. 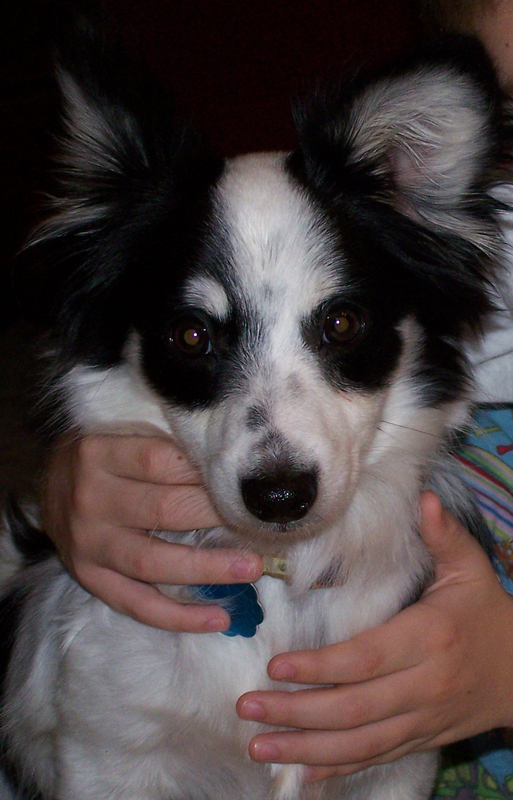 Just wanted to share…that our dog is named Toby, and we call him “Tobus Aerobus” ha ha! He looks really sweet. Remind me not to visit that website, because I, like you do not want a dog. You didn’t have a chance. The second you typed in Petfinder into your browser, your fate was sealed. Thank you for saving this guys life! He needed you! I said I would never get a dog either, until I moved to a farm from the city. I never said I would get a cat, until I heard the mice through the walls of my 100 year old farmhouse. Never said I would ever get another cat, until Needy Kitty came roving down my country road wailing for her mother. I never said I would get any chickens, as I clean the chicken poop of my boots before entering the house to cook breakfast. I said I would live and die in LA…..well I was wrong about that too! You did good mommy, make those kids take are of that buddy. And don’t ever say you’ll. never anything ever again! He’s adorable! 🙂 I have a Toby, too, but he’s a Cavalier King Charles Spaniel. Enjoy him! You did NOT. I am so not a dog person, but he is KEY-UTE! 🙂 I have sworn for YEARS that I won’t get a pet, but my kids really want one. You’ll have to let me know how it goes.